New Delhi: On Monday 18th March, several civil and human rights organizations came together to organize a day-long convention in Delhi’s Constitution Club. The programme titled ‘Steps Towards Hope’ was aimed to take stock of the last four and a half years of the Narendra Modi led Government and the need to strengthen constitutionally mandated citizens’ rights. It was organized by United Against Hate along with PVCHR, PUCL (Delhi), United Christian Forum, Quill Foundation, Rihai Manch and APCR. The speakers for the programme included activists, journalists and lawyers who had brought to fore the issues where the current regime subverted rule of law. They pointed out instances where the current regime had either taken an active part in perpetuating lawlessness like the scores of extra-legal killings in UP or had been complicit in it by ensuring that perpetrators for violence against minorities roam free like Babu Bajrangi. Rajeev Yadav of Rihai Manch, an organization that has extensively worked on hate crimes and failure of law and order in UP pointed out the ways in which violence is being deliberately inflicted to reap political dividends as most of the victims of such violence are from marginalised communities. Most of the victims of alleged encounters were also from lower castes. Fawaz Shaheen of Quill foundation from the figures researched by his foundation gave an estimate of 759 hate crimes during the current regime. He stressed that crimes of this proportion are a national crisis that is being perpetuated in a very planned manner. He also spoke about the need to recognize religious hatred as being a prominent constituent of such violence. Niranjan Takle, the journalist who extensively reported on the suspicious manner in which Judge Loya died, spoke about the rewriting of history that is being done make heroes out of people who had capitulated in front of the British. These are symptoms of fascism that would engulf anyone and everyone who would come in its way. Member of the fact-finding team that had visited Sitamarhi in Bihar after the custodial death of two Muslim youth spoke about the conspicuous nature in which Gufran and Tasleem died and there was no action on the part of the state government to deliver justice. Last several years were not just the times of assaults, they were also part of some spectacular movements. Activists and leaders also spoke about their struggle and the need to forge larger unity. Hannan Mollah, the General Secretery of AIKS, under whose leadership many milestone Kisan marches were organised in various parts of the country gave solidarity to forging a larger unity of all the marginalised people to defeat the fascist powers. He gave importance to the need for mass movements and pointed out how because of the Kisan marches, the plight of farmers has become a central election issue. This opinion was reiterated by Soni Sori, an Adivasi rights activist from Chhattisgarh working to save Adivasi land and livelihood. She narrated the way the government both at the centre as well as the state is pitting marginalised communities in Chhattisgarh in this case between Adivasis and Muslims to continue corporate plunders unabated. Activists spoke about the many anti-people policies of the government and how through collective mass movements, its agenda of furthering Brahmanism and cronyism was pushed back as happened in the 13 point roster issue in university appointment positions as elaborated by Dr Ratan Lal. Sanjay Hegde, an advocate of Supreme Court focussed on the legal battles for securing justice in cases of lynching and hate crime and even the need to bring new laws to curtail and prevent the same. A major part of deliberations in the programme though was a perpetuation of hate and bigotry that has engulfed our civic life, its institutionalised nature and the need to counter it in a systemic manner. Manifesto Against Hate, a charter of demands and agenda against such systemic hate prepared by United Against Hate was discussed. Representatives of various opposition political parties were asked upon to respond with their agenda as to how are they going to counter such subversion of democracy with a definite political programme. Sachin Rao of the Indian National Congress stated that in the land of Gandhi, any revolutionary movement has to be fought through non-violence and every social and political change has to be based on constitutional morality. Ali Khan, spokesperson of Samajwadi Party stressed the need to address all the issues concerning the masses of this country. 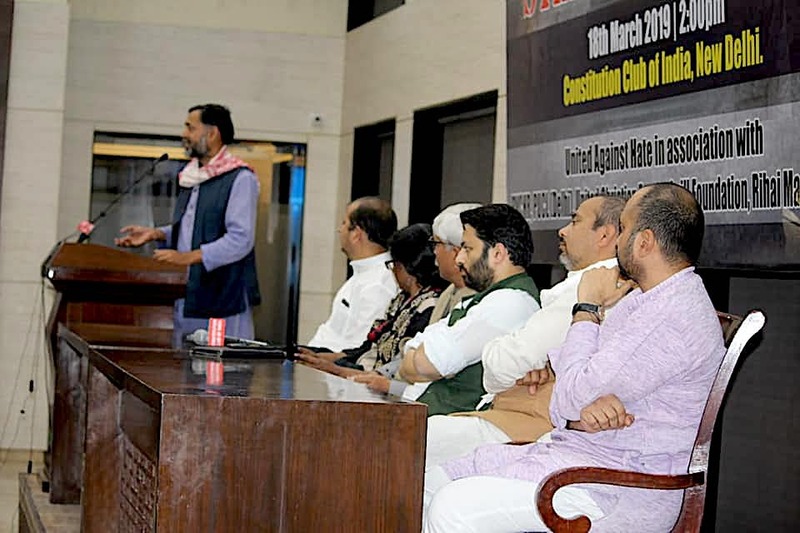 Yogendra Yadav stressed the need to reclaim the religion and composite culture of India by progressive and secular forces, something that has been high jacked by the fundamentalist forces. This was supported by Kavita Krishnan of the CPI(ML) who also said that laws like the Cow Protection Act that are used as a pretext for hate violence should have no place in our statute books. Aam Aadmi Party representative, Dileep Pandey said that BJP, which claims to be a party of Hindus is working to further its own interests and has nothing to do with the welfare of Hindus themselves.